Another month has passed quickly by and it is time once again to post on what is currently in flower in my garden. I am not alone in my posting today and to see what is in flower in other gardens visit May Dreams Gardens and browse the comments on Carol’s Garden Bloom Day post for October. My garden is looking seasonally autumnal as the photos below show. Photos above from top: Acers showing beautiful leaf colours, Acer seed capsules, Japanese Anemones, Sea Holly and Polygala. The Japanese Anemones have continued to display their beautiful white flowers and are looking stunning with the changes in foliage colour with the plants that surround them. The Sea Holly is now starting to show signs of fading and the small tubular creamy white and lemon flowers of the Polygala were a surprise to see at this time of year. Photos above from top: Gunnera flower spike, Golden Hop, Stonecrop Sedum, Ophiopogon planiscpus ‘Nigrescens’ berries and growing through Saxifraga variagata (London Pride). My Gunnera has had a couple of flower spikes for a few months now but soon I will have to consider cutting down its large leaves and pushing them through the spike to protect for it to survive another year. The golden hop is laden with hops at the moment but it’s foliage is starting to show signs of it too coming to the end of the season. In the next two weeks I will have that pruned back to the ground. London Pride is looking particularly colourful at the moment and I love to see my grasses grow through it - in particular the Ophiopogon which has berries developing in other clumps in my garden. Another surprise, whilst taking my photos, was the single stem of red growth on my Peiris – this growth usually comes during Spring. Photos above from top: Sedum Rose Carpet in hanging basket, Clematis ‘Silver Moon’, Brunnera 'Jack Frost', Nepata ‘Walkers Low’, Borage blue and white. Sedum ‘Rose Carpet’ has been looking great in my hanging basket although I had hoped to see butterflies and bees covering it. At the moment my garden has a range of very interesting colours from the wide variety of greens and autumnal colours. 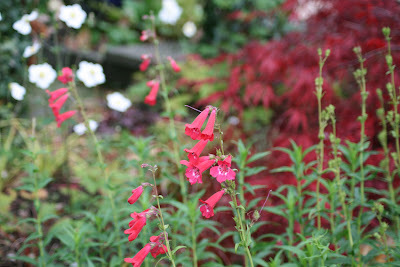 However, it is still holding on to some delicate summer colours with the other plants in the photo selection above. Photos above from top: Cotoneaster Hybridus Pendulus, Calendula, Alpine Aster, Verbena Bonariensis and Cerise Pink Impatiens. Cotoneaster berries add to the splashes of intense colour still seen dotted in small bursts in my garden. These colours are slowly slipping away with each flower finishing but I don’t mind this transition at all. I have a predominately foliage garden so now it is time for me to appreciate these backbone plants of my garden. I enjoy seeing the structure of my garden in the autumn and winter months. Photos above from top: Cirsium rivulare "Atropurpureum" and Penstemon ‘Etna’. 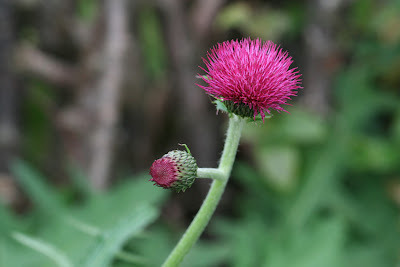 I am delighted to be able to show the first flowers of the second flush on my Cirsium which I cut back completely to the ground after it finished flowering during the summer. Last year I had one single flower spike flowering in December so this year I am hoping for many more second time around! Finally, I am finishing with a photo of the moment as I publish this post. It shows my favourite part of the garden today. There are only a few flowering stems left on my penstemon and in a few days all the beautiful leaves of the Acer will lie crumpled underneath. I hope you are enjoying your garden at the moment as much as I am thoroughly enjoying mine! The photos above were taken in my garden on September14th 2007, with the exception of the last two full sized photos which were taken on September 15th 2007. My post which I did on Saturday (when I had more time) is really for today...as it shows what's in bloom just now. I love your little video of the bluetits inspecting the new nestbox, Shirl! Their colours are wonderful. I felt so happy watching them...they looked so fragile and vulnerable, yet raring to go. I just agree to the comment of a wildlife gardener, your pictures are really delightful and a feast for the eyes. Though you speak of having mostly a foliage garden, there is a large amount of beautiful flowers too. I'm still interested in the gunnera but up to now I didn't dare to plant it in my garden. I saw it for the first time some years ago in Ireland and I suddenly felt in love with it. But when I heard it isn't winterhardy.....but now, you write that you cover the plant with its leaves, I guess this should also be possible here in Switzerland. Well, we do have sometimes temperatures around - 15 ° C and a lot of snow. How is it about your winters? How cold does it get in Scotland? Have a nice and sunny week (we do have it!)! Thanks, I have just visited your post and WOW what a truly beautiful post it is! Thank-you so much for your kind comments :-D I suppose I have added more ‘flowers’ in the last two or three years and I always surprise myself when I have a few for GBBD! Shirl: Beautiful post on bloom day with so much color! I envy you your gunnera but perhaps in a few years I will be able to grow it! Global warming and all. Gardeners take advantage of nature, after all! Yes, who knows what we will be able to grow in our gardens in the future! Shirl, your garden looks delightfully autumnal. I covet your Japanese maple and anemones. People do grow Japanese maples here in Austin, but the soil conditions aren't ideal, and the trees often struggle. If I ever decide to baby one along, I hope it looks as beautiful in fall as yours does. Shirl, your garden is so diverse. I'm sure there is something to see no matter where you look. No wonder it is a delight to the birds, and to us when we see your pictures. Thanks for joining us again for GBBD. Your garden still looks very nice. You're right, we do have a lot of plants in common; not surprising really as we are practically neighbours. ;-) Great pics!